The advice from the angels helps you to find the answer and the solution to a problem, and it outlines your current situation in life. In contrast to the message from the angels, here you have the opportunity to ask about the events of the past and the future. 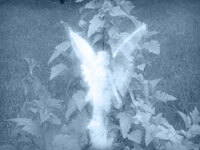 You can also find out which angelic forces are guiding you. The angels will show you that even in the most difficult situation, there is a ray of hope which proclaims a better tomorrow. Before getting advice from the angels, try to think carefully about what you want to ask. You can also ask them for a general analysis of your current situation in life. Remember that you cannot repeatedly ask the cards the same question.